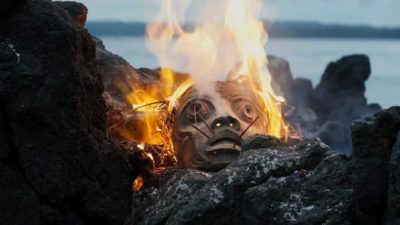 Edge of the Knife (or Sgaawaay K’uuna in Haida) is the first ever feature film to be completely spoken in the Haida language. While there are certainly some lighthearted moments, Edge of the Knife is a dark tale that tells the Haida story of the Gaagiixiid or the wildman. While the film is considered a drama, the main character’s transformation into Gaagiixiid yields some surprisingly supernatural horror/thriller vibes. Though the story of the Gaagiixiid takes front stage in the film, one can’t help but notice the scrutinous attention to cultural detail that film crew took in producing this film. In addition to using the Haida language, set pieces and costumes appear as they would in a traditional 19th century Haida fishing village. As much as Edge of the Knife is good supernatural drama, albeit slow at times, it’s also an intense cultural experience and a great tool to learn more about the Haida people and their language (a language that is nearing extinction). That alone makes it must watch.